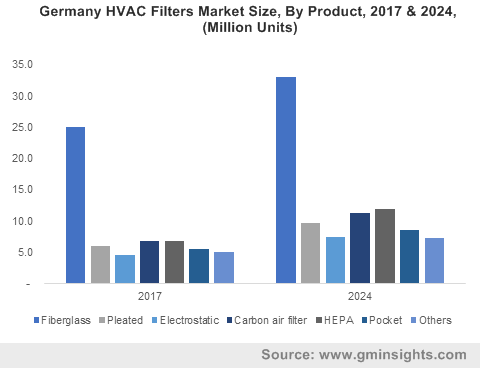 HVAC Filters Market size was over USD 8 billion in 2017 and industry expects demand of above 1.5 billion units by 2024. Increasing consumer inclination for clean air owing to deteriorating outdoor and indoor air quality along with toxic compounds circulation would drive HVAC filters market size. Rising infrastructure development in commercial and residential sectors is likely to boost product demand. The filters are utilized to keep air clean while maintaining steady air circulation in the building. These systems also facilitate heating, cooling, with providing humidity control in infrastructure facility thereby propelling the market growth. The global air filters market should witness strong gains up to 6.5% by 2024. Rising application of the product in several sectors including retail industry, healthcare, real estate, special economic zones (SEZs), airports, and metro rail will elevate revenue significantly over the forecast period. Technological advancements and budding integration of HVAC controls from mobile applications along with growth of smart homes contributes to increasing the market growth. Stringent government guidelines on utilization of refrigerant, sulphur oxide, nitrogen oxide and ammonia would stimulate HVAC filters demand in the forecast timeline. The product is integrated with air filters in industries to remove impurities from air including dust particles, pollens and dirt in the air. Global food & beverage market size should witness gains up to 10.5% in the forecast time period. The product is utilized widely in manufacturing units owing to quality and contamination issues. Food contamination has harmful effects on human health, consumer loyalty and damages brand image. Airborne bacteria are a serious threat in this industry which require fine purification. Food & beverage grade HVAC filters complies with FDA regulations that endure sterilization and sanitization, thus propelling product demand. HVAC filters are made of non-woven fabrics, polyester, cotton, and polypropylene materials. They easily remove particles by trapping them on filter materials and effectively trap dust, pollen, molds and pet dander. Growing demand for air purification and utilization of energy-efficient filtration systems would save energy costs thus positively supporting market growth. Robust R&D with government initiatives for clean air to boost the utilization of the products has encouraged substantial investments on technology innovation. Increasing adoption to enhance air quality, decrease contamination, meeting required specification along with stringent controlling standards by EU, FDA and EPA restraining pollution and infection will favour HVAC filters market growth. High cost of installation and need for regular maintenance of the product may hinder HVAC filters industry profitability. The regular maintenance of these systems proves to be expensive for consumers. Cleaning and maintenance of product is difficult owing to several layers of filter media that must be removed and cleaned individually, hampering the market growth. Fiberglass HVAC filters market size may surpass USD 1.5 billion by 2024. Fiberglass filters are commonly used in household settings and easily trap large airborne particles having MERV rating of 1-4. Fiberglass media is made of disposable spun-glass & is inexpensive. These factors may cater towards boosting industry growth. Pocket HVAC filters demand may observe significant gains over 5% up to 2024. They are utilized as pre-filters or as final filters. It is appropriate for vertical and horizontal flows of air handling units (AHU), in kitchen hoods for hotels and restaurants. They are also used in industrial applications including construction, pharmaceuticals, and livestock production facilities to capture minute dust particles which may be harmful to consumers as well as workers, thus propelling product demand. HVAC filters market size from residential application is predicted to exceed USD 3.5 billion by 2024 owing to rising concern for fine quality indoor air for healthy living. Indoor air is a complex combination of substances, including pollutants from outdoor and indoor sources. The product helps in removing several contaminants from indoor house environment, hence driving market growth. HVAC filters demand from food and beverage application is projected to show gains of over 5.5% up to 2024. Food & beverage industry requires purified compressed air to preserve food and the product provides food safety from microorganisms including fungus, bacteria, and viruses for hygiene of the products and users. These factors may cater towards stimulating industry growth. Asia Pacific led by India, China, South Korea, and Japan HVAC filters market is predicted to exceed USD 5.5 billion by 2024 due to easy sourcing of raw material and availability of cheap labour. Growing awareness about air pollution and its ill-health effects may provoke product demand in healthcare industry. Europe driven by Italy, UK, France, and Germany HVAC filters market demand may witness significant gains up to 4.5% by 2024. These products are installed in central heating, ventilation, and air-conditioning system to improve indoor air quality, thereby curbing pollution level. Stringent government regulations pertaining to volatile organic compounds (VOCs) emitted from building materials, and architectural coatings may stimulate regional product demand. Brazil HVAC filters industry may witness significant gains in the estimated timeframe owing to increasing awareness for contamination free air which is non-toxic. The product usage has been urged & initiated by the government to reduce harmful influences of airborne infections which may fuel regional market growth. 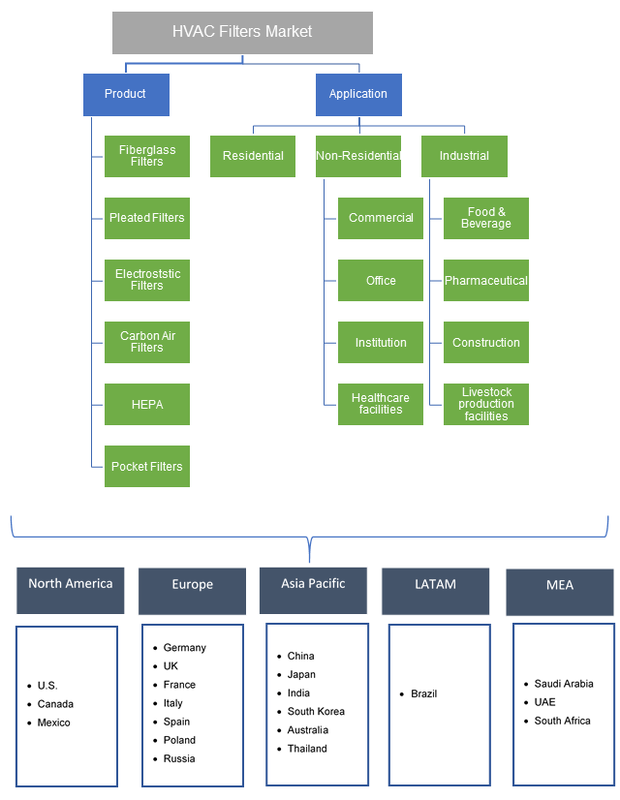 Global HVAC filters market share is moderately fragmented and highly competitive with major manufacturers including Camfil, Emirates Industrial Filters, Filtration Group, AAF, Freudenberg & Co. Kg, and Koch Filter. Companies are involved in strategic alliances including mergers & acquisitions, joint ventures, partnership, and capacity extension to implement innovative technologies with growth in production capacity to cater rising HVAC filters demand. In January 2017, AAF Flanders acquired Aire Filter Products (AFP), this acquisition helped company in expanding its operations across western U.S and enhancing the quantity and the level of services. HVAC filters provide heating and cooling applications for residential, non-residential, and industrial sectors. The product provides fresh outdoor air to screen out interior airborne contaminants including odour from occupants, volatile organic compounds emitted by construction materials, chemicals, and coatings. Efficient designed system would provide a comfortable indoor environment if well maintained.